Never the same, this welsh weather. Breakfast at my kitchen window seems to undermine, daily, any plans I have had had the temerity to make. This last winter, there was grey gloom for what seems like weeks, then torrential rain, persistent drizzle, deep frost, frozen ground, then muddy ground. The squirrels and the birds are fighting over the grains and nuts I put out for them. The molehills multiply daily. I have watched my grass (it really doesn’t qualify as a lawn) gradually turn from firm ground, to solid as concrete, to the texture of sticky blancmange. I’m an animal lover, as you probably know, but I’m currently quite cross at the moles who are just making things worse by throwing up soil and clay onto the surface. Once a passable green swathe it is now mostly muddy brown where my wellies, and my four legged friends’ feet have slipped, got stuck and been pulled out of the surface again. I really wish the moles hadn’t chosen my garden but I am not going to trap them using the scissor traps that neighbours use to limit the mole population by placing them just beneath the surface in a mole hole. When triggered they skewer or crush the little animal. One of my neighbours favours these, proudly, and has been marking each kill with a notch on his shed wall for the last 15 years. The moles keep coming and are winning the war of attrition; It’s a wonder the shed is still standing. 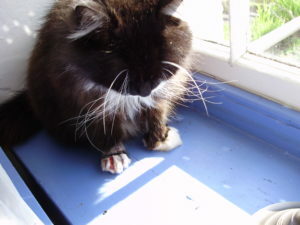 He once trapped the paws of my cat, causing serious damage to her paws, and to my pocket at the vet’s. No matter how cross I am, I will not be using glue traps which also catch birds and other small mammals who are then left to struggle free, ripping off fur, feathers and skin, sometimes for days until the trap setter returns. Nor will I be poisoning them by pouring petrol or other noxious substances into my soil, nor shooting them, nor catching them and illegally drowning them. None of these things sound to me like what love requires. Nor do they sound like the actions of someone who has testimony to the environment and the wildlife in it. We can’t witness to the environment and ignore the animals in it, can we? Can we pass by on the other side? Variously ignoring, injuring and killing the wildlife that share our environment. Those we seem to feel most ambivalent about, sometimes loved, mostly hated, are the grey squirrels. Reviled during the 17th century in America, a project designed to reduce their numbers rewarded hunters at the rate of three pence per squirrel head. It was so popular that the treasury had to withdraw the bounty. They then became fashionable and people took pleasure in seeing them in their gardens, so they were transported to areas in America where they were not indigenous, fed and provided with nesting boxes. During the 19th century the fashion spread to Britain where they are now blamed for the reduction of the native red squirrel population. Although habitat decline and endemic diseases are the main threat to both species, competition for the same foods from the more resilient and numerous greys hasn’t helped the red squirrels’ lot. Favourite foods for both red and grey include fruit and veg from our gardens and bark from our trees. People welcome a sighting of a red squirrel in their gardens, especially as they are protected under the Wildlife and Countryside Act (and they are cuter). Some of those same people also do horribly cruel things to the greys: sometimes legally trapping them and putting them in sacks and then bludgeoning them to death, sometimes shooting them with the risk that they might be merely wounded. They are illegally poisoned and drowned. Often the young are left to starve slowly to death when their mothers have been killed using one of the above methods, none of which sound humane to me and there is often collateral damage to other species. I fully understand why damage to our tenderly nurtured gardens is taken personally but, for me, human’s place in creation is to nurture a dominion of love. A more humane and holistic approach is to work out how to coexist with wildlife. Mice, rats, rabbits, squirrels, moles, pigeons, foxes, badgers, bats all live alongside us and whatever we do, a garden is unlikely to be pest free for long. It takes squirrels, for example, only a month to move into a vacant and desirable garden. Because our gardens are desirable. We kindly grow food for some of them and provide habitat for other foods: worms, slugs, leatherjackets, and other insects. And then we are surprised and annoyed when small mammals wreak havoc in the five star bed and breakfast we have provided for them. Nothing better for mice, squirrels, birds than badly maintained sheds, rood spaces and attics. Animal Aid suggests instead that we look at what it is that is attracting them and use physical barriers such as rabbit proof fences. Chicken wire and old palettes may not be aesthetically pleasing but they can be effective. 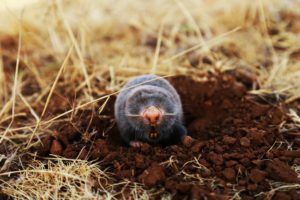 I can’t build a barrier against my moles but properly built barriers can be effective against rabbits, squirrels, mice, birds etc. I can, however, try beneficial nematodes to reduce the grub populations; it’s worth a try. They are welcome to any slugs they can find. Just as I choose plants that grow well in our low light, high rainfall welsh climate I can also choose to grow plants that don’t feed the voracious appetites of small mammals. We can also encourage natural predators. And it might be worth thinking about feline predators and balancing the pleasure of seeing small birds on our feeders against smaller crops of fruit and vegetables, losing the bark from trees and bushes. The mud will wash off, and the grass will grow again, but respect for our fellow creatures will nourish our souls and our planet. Meanwhile I’ll try not to make mountains out of molehills. As ever, the internet provides lots of information to help us decide the most ethical and moral way ahead. We might even think of joining the RSPB Give Nature a Home campaign. Lawson, Nancy. The Humane Gardener: Nurturing a Backyard Habitat for Wildlife. Princeton Architectural Press. Kindle Edition. Etienne Benson, “The Urbanization of the Eastern Gray Squirrel in the United States,” Journal of American History 100, no. 3 (December 2013): 691–710. Author’s note: this was written in the early spring and, since the drought there are now no molehills in my garden.